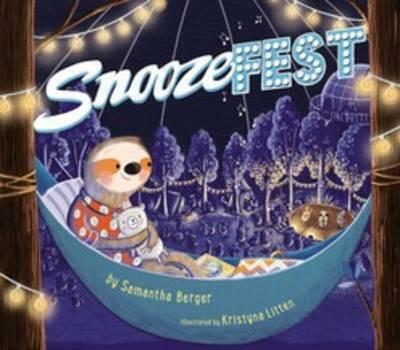 SnoozeFest introduces us to Snuggleford Cuddlebun, a sloth who is so sleepy that she only properly rises for one thing, and that is the annual snooze festival. All of the sleepiest animals - koalas, bears, wombats and cats - attend Snoozefest, where there is warm milk and honey and a great pyjama fashion show. But it is after they set up their beds in the great NuzzleDome and all turn on their night lights from home, that the magic really begins. By the twinkling nightlights, they all doze to the sleepiest of entertainment from bands with names like Chamomile Rage, Nocturnal Nesters and Quiet Quartet. Snoozefest is so amazing in fact, that Snuggleford does not wake up until several days later, when the festival is over for another year. This book is peaceful and soothing from start to finish, there is no problem-solving or issue to overcome, it is just a lovely and quiet celebration of all things slow and drowsy. The rhyming text sets a relaxed pace and the soft autumn palette in the illustrations are warm and dreamy. A perfectly calming story for bedtime reading, however it might be best if you don't lie down in bed to read this to your child, as it is highly likely that you may not get up again.